When you think of a nurse, you think of Band-Aids, syringes and those iconic nurse outfits, but more than that, you think of their tireless work for others. Give the nurse in your life a gift that shows you care and admire what they do. Whimsical Gifts offers novelty nurse gifts and accessories that can’t be found anywhere else. Request monograms or custom color changes to our watches to add a very personal touch that they’ll hold near to their heart. 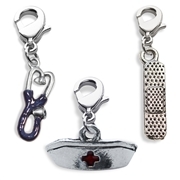 Our wide variety of cute jewelry gifts for nurses ensures you can find the exact gift you’re looking for. A nurse wristwatch and other jewelry presents, like bracelets and charms, are some of the best personalized gifts for nurses, and they’re also fantastic if you’re looking for unique nurse appreciation week gifts. No matter the occasion, these whimsical accessories will make wonderful and thoughtful gifts. Pick from our wide category below to insure you find the perfect gift for the nurse in your life.